Looks great with chairs. Easy assembly. Add a unique aesthetic design to your patio and backyard with this Sarcelles patio table by Corvus. Made of metal frame and PE wicker, the outdoor table features wicker cord design and a glass table top. Available in black, blue and grey color, it matches perfectly with the patio chairs of our Sarcelles collection. Dimensions 17.7 In. X 17.7 In. X 18.1 In. I love this patio side table! The blue is slightly darker than the photo but it is a lovely shade of turquoise blue! The legs are black and the glass top is thick and sturdy! I love it so much I am going to order the matching chairs! Thanks Overstock! Beautiful quality side table that compliments our Wicker chairs on the front entrance! Nice little table that I got to with the Sarcelles chairs. The blue color is a perfect match to the chairs. Very pleased with this purchase. It's exactly like the picture and complements the rest of my decor very well. As it's top heavy and only has 3 legs, make sure you're getting it for somewhere lower traffic so it doesn't get knocked over. I only wish they'd improve the 'suction cups' that are meant to stabilize the glass: they're built onto the table and are misshapen and angled wrong, so don't do as good of a job securing the top as they could if they were just a little better quality. The table (and chairs) look great. I get many compliments on the set. They are comfortable enough and not hard to assemble. However; I recommend having a power drill (for anything you need to assemble). The only reason I'm not giving it 5 stars is because the color on the website looks different than the product. The table (and chairs) are more blue than they are aqua. Still, they look really nice on my patio! 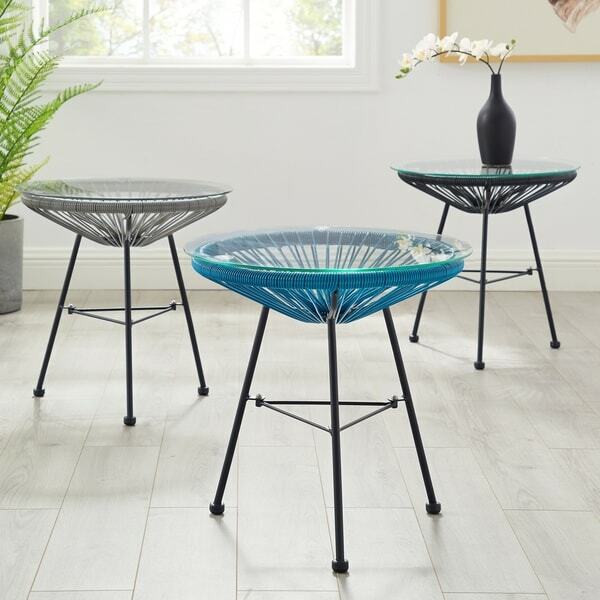 I got this to match the Sarcelles Modern Wicker Patio Chairs that I also got from Overstock. It's cute, but I do wish that it was a little bigger (notice in pic how small it is compared to the chairs)... and feel like it's a little over-priced. Probably would not have kept if I didn't have the matching chairs. I bought the matching chairs and table. The table price seems a little high, but its really cute. And I'll have to clean the glass. Love this table, the color is awesome, very sturdy! Love the glass metal combo on this product it’s a great one! Once we expand our outdoor space we will be buying another one! I've bought the chairs at another place and looking for a table and it is a perfect match. This was the lowest price I could found and the quality is fine. 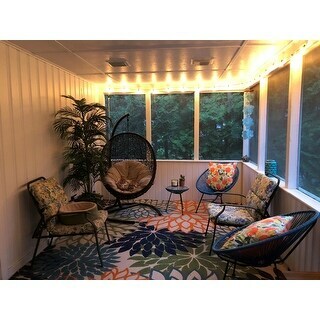 It’s perfect for my small patio and comfortable too. Came in perfect condition. Very easy to assemble. Took me 6 min. Comes with instructions, tools and screws. Looks perfect with the matching chairs. Nice work and look, but a bit too small. Would recommend though. 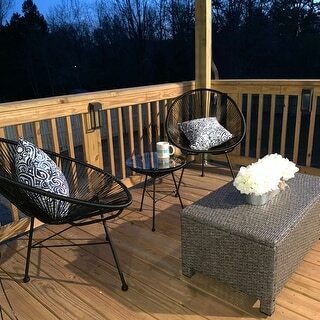 I bought 4 chairs and 2 of these tables...perfect for patio. They look awesome too! This table is perfect and looks great with the matching chairs I also purchased. The blue color really pops and is a welcomed addition to my back patio. "I am having trouble with the triangle. Anyone have a trick on how to connect it? The instructions say to put the legs on first but the triangle will not fit across." "Will grey be back in stock soon?" It will be back in mid-August. To go with the chairs I ordered.